The fortress of the Chhattisgarh parliamentary constituency is one of the most hypefile seats in the province. The credibility of State Government nominees is more than the BJP and Congress candidates in this seat. In the Durg parliamentary area, Chief Minister Bhupesh Baghel is the constituency constituency of Home Minister Tamr Dhwaj Sahu, Agriculture Minister Rabindra Choubey and PHE Minister Guru Rudra Kumar. In this case, this seat has remained the subject of credit for the Congress. In the Durg Parliamentary Constituency, a total of 19 lakh 38 thousand 319 voters will be able to exercise their franchise on April 23. Chhattisgarh's fortification Lok Sabha seat was held by the BJP for a long time, but this was the only seat of 11 out of 11 assembly seats in the state which won the Congress. The Durg parliamentary area covers almost the entire area of ​​Durg and Bemetra districts in Chhattisgarh. Apart from this, some part of Balod district also comes in this parliamentary area. This constituency is also politically sensitive. Because here people of every class and community will meet. Durg city is also the administrative headquarters of the district along with the important agricultural market of the state. Chhattisgarh's fort constituency is reserved for general category. Since Independence, 16 constituencies have been held in the Durg Lok Sabha constituency. Between 1952 and 1999 Bilaspur constituency was a part of Madhya Pradesh. After this, three Lok Sabha elections have been held in the fort from Chhattisgarh in 2004 to 2014. In the elections of 2019, a total of 21 candidates from the Durg seat are in the fray, but the direct contest is between BJP's candidate Vijay Baghel and Congress candidate, statue Chandra. BJP has been dominant in this region since 1996, but in 2014 elections, Congress managed to grab this seat. This constituency was elected as Congress MP in the 2014 elections by defeating BJP's prime ministerial candidate Saroj Pandey. Chandulal Chandrakar, one of the most important leaders from this constituency, has won five Lok Sabha seats. He worked hard to build Chhattisgarh at the end of 1990. BJP won 5 consecutive elections in the fort from 1996 to 2009, out of which four Tarachand Sahu won. Shortly before the 2009 Lok Sabha election, Tarachand Sahu was expelled for anti-party activities by the BJP. As a result, he established the Chhattisgarh Swabhiman Forum, opening the third front in the state. For this, he tried to unite non-BJP and non-Congress parties. Durg Lok Sabha seat has been contesting directly between BJP and Congress till now. In 2009, Tarachand Sahu contested independently and remained in third place. In the 2014 election, there was a direct fight between the Congress and the BJP. This time, the former Chief Minister of Chhattisgarh, Ajit Jogi's party and the BSP combine are also ready to challenge the two parties. This whistle is the challenge of restoring BJP to its empire. There are nine seats in the assembly under the Durg Lok Sabha. These include Patan, Durg Village, Durg city, Bhilai Nagar, Vaishali Nagar, Ahivara (SC), Saza, Bemetra and Navagad (SC). According to the 2011 census of India, the population of the fort is 33,43,079. There were 945,656 male voters in this Lok Sabha constituency in 2014, out of which 660,504 participated in the voting. Of the 910,125 female voters registered, 597,838 female voters participated. In this way, 1,258,342 out of a total of 1,855,781 voters fixed their stake in the elections. In the seventeenth Lok Sabha elections of 2019, a total of 19,38,317 voters will choose their constituency MPs. Now Rajnandgaon seat was dominated by Dr. Raman Singh and his son Abhishek Singh, but due to the new face, people are appearing in the place of confusion about Santosh Pandey. Polling for the second phase of Chhattisgarh will be held on April 18 for the Lok Sabha elections 2019. The second phase of voting will be held in Kanker, Mahasamund and Rajnandgaon. 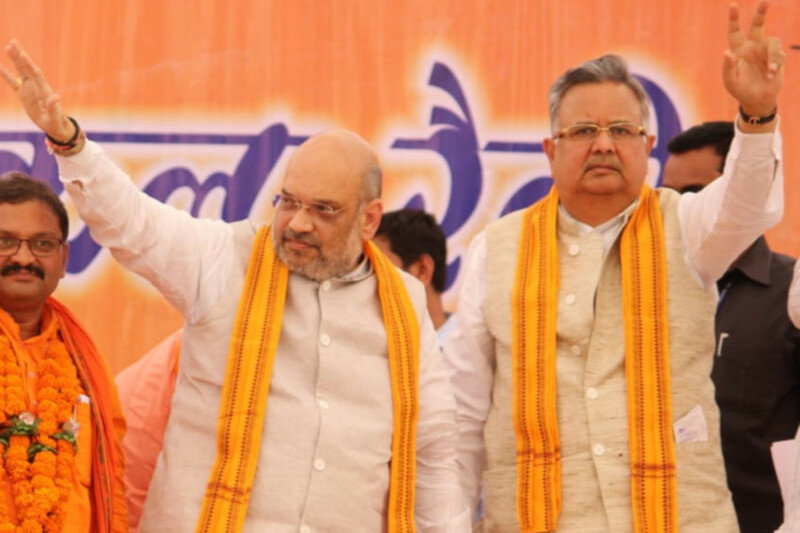 But the most discussed here is the HighProfile seat of Rajnandgaon, where the party has created a new face Santosh Pandey as the candidate by cutting the ticket of former Chief Minister Dr Raman Singh Abhishek Singh. BJP's Santosh Pandey is in the Bholaram Sahoo grounds of Congress. Now Rajnandgaon seat was dominated by Dr. Raman Singh and his son Abhishek Singh, but due to the new face, people are appearing in the place of confusion about Santosh Pandey. Please tell that in the Rajnandgaon Lok Sabha constituency, there are 8 seats in Vidhan Sabha, which include Pandaria, Kavardha, Rajnandgaon, Dongargaon, Dongargarh, Khuji and Mohla-Manpur. In the recently held assembly, 6 of the 8 seats have gone to the Congress, 1 seat Jogi Congress and only one seat is with the BJP. Now despite the son's ticket in the Lok Sabha, due to the former Chief Minister's home district, the reputation of Dr. Raman Singh was taken from the Rajnandgaon seat. Therefore, in the promotion of Santosh Pandey, Dr. Raman Singh himself is in the field. Here, the BJP is clearly refusing to say that the credibility of any leader is linked to the victory in any seat. BJP spokesperson Sanjay Srivastava says that any election combines jointly. There is no big child in BJP. The credibility of all is important here. For our success in every election. The point of credit is for those who do politics in this matter. At the same time Congress spokesman Vikas Tiwari says that in the same way, most of the assembly seats in the Rajnandgaon Lok Sabha seat are in the possession of Congress. In such a situation, the Congress is confident of its victory. There is a new twist after the other in the electoral battle of the Lok Sabha. While 'I too have a watchman' campaign, on the one hand, on the other hand, Chhattisgarh Congress has tried to scare the Nalli by running a 'little man' campaign. In Chhattisgarh, the color of Lok Sabha elections 2019 is gradually rising to all political parties. When the Prime Minister Narendra Modi and Amit Shah, President of the Bharatiya Janata Party, put the words of janitor in front of his name in the turf-e-jung of tweets in the state, the politics of the whole country changed. But a statement from BJP's National Vice President and former Chief Minister of Chhattisgarh Dr. Raman Singh gave the Congress an opportunity to run a small man campaign on the lines of 'I too watch' campaign. In fact, answering a question on Friday, Dr. Raman Singh gave the CM Bhupesh Baghel a small man. Following this statement, the Congress fiercely gave it political color and started the campaign with the younger man. Talking to the media, former CM Dr. Raman Singh had said that such a small man, with small mind, makes such a move that he becomes the character of fun. Speaking on this statement of Dr. Raman Singh, CM Bhupesh Baghel said that I am a farmer, I have selected farmers here, so I do not want to remain small nor be small. In fact, a controversial statement in politics is so wounded. Nobody can understand better than the Congress party. This is the reason why Rahul Gandhi's statement of Hindu terrorism or statement of leaders like Manmohan Singh, Sharad Pawar, Salman Khurshid, P. Chitambaram, Manishankar Aiyar. One of these leaders has made the Congress away from power on several occasions. Now that Congress is a better candidate for such statements, then how will Raman Singh's younger man not recant his statement? This is the reason why the Congress has made it a campaign, while BJP is ticking on it. Chhattisgarh Congress Communications Department chief Shailesh Nitin Trivedi says that the party is with Chief Minister Bhupesh Baghel. All the members of Congress have added a short man word on all their social media profiles. Now the Congress will run it as a campaign in the entire state. At the same time, BJP spokesperson Sanjay Srivastava says that in whose history big scandals have been written, how can they be small men? Congress is simply copying the campaign of BJP. Jogi Congress spokesman Iqbal Rizvi said that the idea stream of Ajit Jogi and Congress party is the same. He said that homecoming can be done at any time. In Chhattisgarh the political front of the third front seems to be a replacement. Jogi's knit is slowly slipping. In such a scenario, it is being speculated that in the coming times, the Congress will not merge in the Congress party. Indeed, the signs that Jogi Congress is getting from, it seems that Jogi's Chhattisgarh Janata Congress Party may merge in the Congress party in the coming days. This is a sign that Jogi Congress chief Spokesperson Iqbal Rizvi has himself given himself. Rizvi said that the views section of Ajit Jogi and Congress Party is the same. He said that homecoming can be done at any time. At the same time, the Congress party also believes that the spirit of Ajit Jogi who left the party with him has not been fulfilled. PCC spokesman Rajesh Bissha says that the public denies the spirit Jogi ji left when Congress left the Congress. Now he and his people are compelled to join the mainstream. That is why Jogi Congress leaders are stunned to join the Congress. At the same time the Congress is also accepting those people who really had good feelings. Here, BJP too is convinced that Jogi Congress will finally merge with the Congress party. This is the reason why Jogi is leaving a large number of leaders and workers from Congress. On the other hand, the BSP is not ready to accept that Ajit Jogi's party can do something like this. Ajit Jogi has stood with full force to win the BSP and defeat the Congress party. BSP state in-charge ML Bharti says that such a thing is not going to happen. Jogi ji has given his support to all the 11 seats of the Lok Sabha in the BSP. However, the way people are disillusioned with Ajit Jogi's party and a large number of Jogi Congress leaders and workers are going to the Congress party. This makes it seem clear that the days are not far when Ajit Jogi has to join hands with the Congress. In Balrampur district, the tableau of Lord Rama and Sita was removed by the Hindu society in Chausra Navaratri and Hindu New Year in Kusme. In the Balrampur district of Chhattisgarh, Chattra Navratri and Hindu New Year were given a tableau of Lord Rama and Sita by the Hindu society in Kusme. During this time, people said that here, for the last several years, the arrival of the Chaitra month with the enthusiasm of the people of the Hindu society and the holy days of Navratri are collected by the devotees in large numbers by joining together with festoons in the city. Together, the congratulations of Hindu New Year are given to each other. About this, local resident Viseesh Sahu said that for the past several years, the celebration of Lord Rama was taken by people of the society at Chausra Navratri and Hindu New Year on the occasion of Kusami. Also, the program of Hindu Convention is organized. In such a way, more and more people in the area also attended this year. In Chhattisgarh, BJP President Amit Shah will address a general meeting in Dongargaon, Rajnandgaon. On the other hand Uttar Pradesh's Chief Minister Yogi Adityanath will also address the meeting in Ambikapur, Janjgir Champa and Abhaanpur. In Chhattisgarh, Bhartiya Janta Party national president Amit Shah will campaign for Rajnandgaon Lok Sabha seat on Friday 12th April. During this time, Amit Shah will address a general meeting in Dongargaon district. On the other hand Uttar Pradesh's Chief Minister Yogi Adityanath will also address the gathering in Ambikapur, Janjgir Chamba and Abhaanpur on Friday. Amit Shah will reach Raipur Airport at 3 pm. Information about the matter has been given by BJP spokesperson Sachchidanand Upasane. In the matter, BJP spokesperson Sachchidanand Upasane said that on April 12, Uttar Pradesh's Chief Minister Yogi Adityanath will come and address public meetings there. After this, address the meeting in Abhaynpur's New Delhi. After this he will go straight to Varanasi. BJP President Amit Shah is also coming to Chhattisgarh on 12th April, where he will address a general meeting in Dongargaon. Together, the party will ask for votes for the candidates. While CM is trying to win the party, he is appealing for a win for the party candidate, while at the center the BJP is failing to criticize the government's failures. Chhattisgarh Chief Minister Bhupesh Baghel is carrying out electoral rallies for the Lok Sabha elections. In this order, they will now demand a vote in favor of Congress candidate Chandrakar in his home district fort. CM will see Bajail, where the party is appealing for the victory of the candidate, while not ignoring the BJP's failure of 15 years. Hitting out at the former CM Raman Singh and the central government, Raman Sarkar did not solve the problem of water in 15 years, but five years ago the janitor had made many promises, none of which was completed. The sixth phase in Bhilai, Vege Revision and the employment issue of youth is getting quite hot. Let me tell you that the same issue was also held in the last assembly and Lok Sabha elections. Now once again, by raising the old issue, CM Baghel has warmed up politics and assured that if all the problems in the center are made in our government at the center then all the problems will be solved. To whom the plant workers say that the previous governments did nothing, so now they have a great expectation from the Congress. However, the Durg Lok Sabha election is becoming very exciting day by day. Every day there are new issues coming everyday in the public and the public is also blocking the people's representatives. It is imperative to see in such a way that the fort of fort is fortunate in this election season. Raipur. Chief Minister Bhupesh Baghel has challenged the former Chief Minister and BJP's National Vice-President Dr. Raman Singh for debating the Chhattisgarh government's debt to be immersed in debt. The Chief Minister has said that he is ready to come to any forum to debate this matter. Dr. Singh, who is the Chief Minister of the previous BJP government, has said that due to financial mismanagement of the Congress government, Chhattisgarh's treasury has become vacant. State debt has plunged into debt of thousands of crores. On this, Chief Minister Baghel has said that Raman has lied once again. The BJP has 15 years of government in the state. At present, the Congress got power, along with the burden of debt of 50 thousand crore rupees. This loan was taken by the previous BJP government. Baghel says that loans were taken for such construction works, which were not needed. If the Congress government apologized to farmers, Raman Singh and BJP are suffering in the stomach. If the value of paddy is being given to 25 thousand rupees per quintal to the farmers, then there is a pain in their stomach. Jashpurnagar 01 Aparl 2019 / Voters Awareness Campaign is being organized in village-village in Jashpur district. In the past, voter awareness program was organized by Tribal Welfare Department in village Talasili of Manora Vikaskhand. After giving the experimental information of voting through Electronic Voting Machin in this village, the in-charge of the Voter Awareness Party has vowed to vote villagers without any fear. Under the program, Jashpurnagar 01 April 2019 / Jashan-e-Jashpur, on 31st March, girls of post matriculate hostel of Jashpur gave a message of meritorious vote by making Rangoli. Girls' hostels of post-matric hostel took part in the Rangoli program with the objective of providing the information about voter awareness in the hostel premises, hostels of the hostel Meira Pradhan, Suman Chauhan, Aarti Singh and Swarnalata. On this occasion, hostel superintendent resolved to vote for girls on this occasion.